Hong Kong China claimed both the men's and women's titles in the Asian Squash Team Championships for the first time in the event's 37-year history in the 2018 championships in Cheongju in the Republic of Korea. The 19th staging of the biennial event attracted 15 men's teams and 11 women's teams from China, Chinese Taipei, Hong Kong China, Iran, Iraq, Japan, Jordan, Korea, Malaysia, Pakistan, Philippines, Qatar, Singapore, Sri Lanka and Thailand. Hosts Korea made history in the women's championship by reaching the final for the first time after upsetting second seeds Japan in the semi-finals. However, Hong Kong were too strong for the fifth seeds, winning 2/0. Hong Kong number one Annie Au beat Korean Ahn Eun Tschan 11-4, 11-5, 11-5 before Joey Chan came back from a game down to beat Lee Ji Hyun 8-11, 11-0, 11-2, 11-7. The victory marked Hong Kong's fifth women's title in their seventh final appearance in the last eight events. The bronze medals went to Japan and Malaysia. The men's final was a repeat of the last Asian Team Championships two years ago in Chinese Taipei, but this time favourites Hong Kong gained revenge over title-holders Pakistan to beat the second seeds 2/0. Max Lee put Hong Kong ahead in the opening match after defeating Farhan Zaman 11-9, 11-9, 11-7. 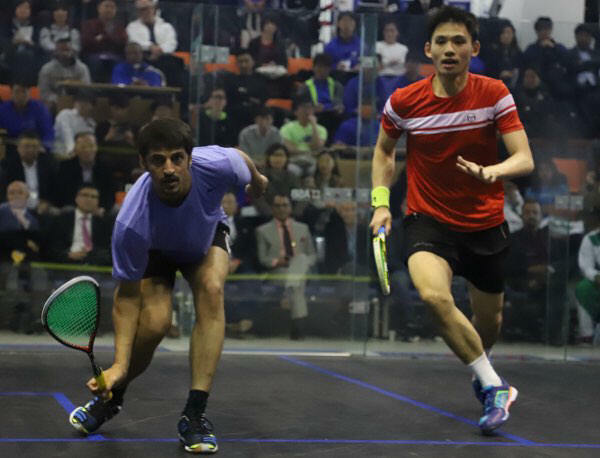 Though Leo Au dropped the second game to Tayyab Aslam, the Hong Kong No.2 fought back to claim victory 11-6, 8-11, 11-0, 11-7 and clinch the historic first ever men's gold medal for the team. "This is a massive achievement and it proved that our bronze medal at the World Championships last year was no fluke," Lee (picture above, right, in Asian final action) later told the South China Morning Post. Iran also made history by winning its first-ever bronze medal in the Asian Team Championships after the fifth seeds beat Japan in the quarter-finals. Malaysia also finished co-third. "Korea Squash Federation is very happy to see so many teams showing their support and coming to Cheongju to participate in the Championships. We are also thrilled to see our women's team win the first-ever silver medal in the hometown. It is very encouraging!" said Ms Heo Tae-sook, President of Korea Squash Federation. 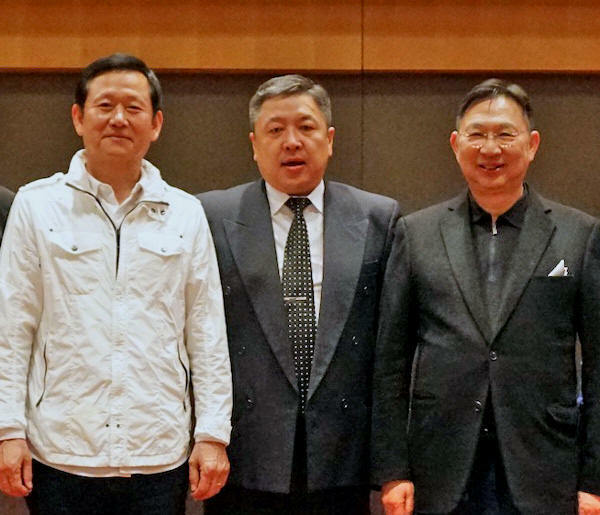 David Mui, the ASF President was grateful to Korea Squash Federation for hosting the Asian Championships: "The Cheongju International Squash Stadium that was used for the championships is superb. There are 7 single courts with glass back wall and 1 all-glass court, which make it a perfect venue for both training and competition. The event was also well organised. "I would like to express my sincere appreciation to Korea Squash Federation, who made the Championships all the success. My thanks would also be extended to all the officials, referees and helpers." At the 38th ASF AGM, which was held during the championships, the Mongolian Squash Federation became an ASF member. James Huang bt Sun Phat 11-3, 11-2, 1-1 ret.